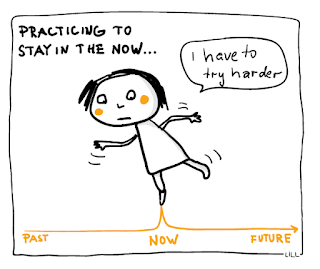 With a Lill Inspiration...: Newsflash: "Staying in the Now" Is a Crock! It's frustrating to suddenly realize that I'd been thinking about a problem at work while actually gazing at the sunset on a beautiful beach. Or maybe it's a snap back to the delicious dinner with friends instead of getting lost in thought about which bills were due this week. We all do it. We've taken the mantra of 'staying in the now' and turned it into another reason to berate ourselves for falling short of some spiritual or enlightened goal. With the help of Ingen Findes, let's take a look at the "Present Moment". To do that, we'll need to look at the nature of time itself. Time. It seems to be a measure of change rather than something I can get my hands on. That's evidenced by the fact that when I'm indoors, I have to look at a clock in order to keep track of my day. Outdoors, it's much easier because of the changing angles of the sun, or just the multitude of changing events. Time is change. I can't seem to define it more than that. 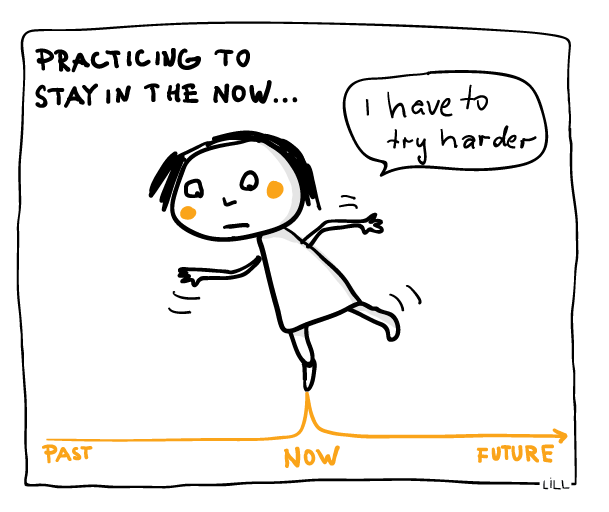 Before understanding how to stay in the now, I'll need to define it. And I'm having a real problem with that. When I look for an "incoming" now, I just get... Now. When looking for the end or "outgoing" now, I get... Now. I cannot find a demarcation or line between the past, present, or future. It's just one long continuous now! Past appears only in thought, and so does future. Guess what that means? There is absolutely no way to not be in the now. That's the good news. But then what's happening to cause the feeling of not being 'here, now'? It seems that the only time I'm not in the Now is when I've framed a scene in my mind, or compartmentalized life into segments. THIS is dinner time. THIS is beach time. THIS is writing a blog post time so I shouldn't be thinking of sushi. But what happens if the compartments are false? Are there actual compartments in reality or is this just some lame left-brained idea? Doesn't that mean that no matter what is happening, it's happening NOW and is the NOW? Why have I imposed false rules about what is supposed to be happening at any given time as though I can structure every single aspect and moment? Seems kind of weird to think about this. But no matter what happens, I'm only ever in the moment. And when I realize that instead of thinking of bills, I'd rather think of the shoreline in front of me, then that's what I do in THAT moment. Mission accomplished. Struggling with this is wholly unnecessary. Is it Now, now? What about Now? Try to leave the present moment and jump into the future, or move back into the past. Is it ever possible? Keep trying to leave the now. When the thought that you are not "living in the now" comes, when is that thought occurring? Can you ever fail to stay in the present moment? Are you a time traveler? If you could travel through time, what time would it be when you got there?